The wrath of Aeolus (the Greek god of wind, hence "aeolian" phenomena) historically has had catastrophic effects on the human biological and cultural environment, manifested in hurricanes and typhoons in the tropics, in blowing icicles and blizzards in the colder regions and in dust storms in arid areas. 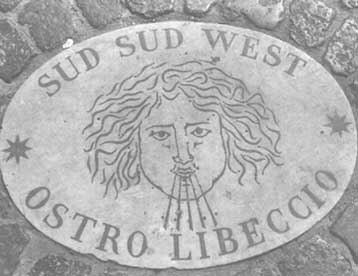 Of all the regions of the earth, the arid ones are the most susceptible to and the most seriously affected by wind. This article briefly describes the process of wind erosion and explores a number of forestry-related prevention and control measures. Brahim Ben Salem was Senior Forestry Officer. FAO Regional Office for the Near East Region. His sudden death came shortly after the completion of this article. Erosion is the process of dislodgement and transport of soil particles by the two main agents of erosion - water and wind. It is often difficult to determine which is the dominant agent on a particular site. In general, however, wind erosion is a long-term process of gradual removal, while water erosion is often very rapid and impressive. In fact, until the start of the present century it was believed that the main agent of erosion was water. This lack of awareness and appreciation of the action of wind perpetuated a low priority in the study of aeolian phenomena and of their effect on soil and vegetation resources. Probably the landmark in official concern about wind erosion was the Prairie State Forestry Project in the mid-1930s in the United States. Since then considerable progress has been made in understanding wind climatology, particularly wind damage to plants and animals, and the mechanics of erosion. In recent years much progress has been made in the evolution of technologies for the prevention and control of wind erosion, although on the application side much still remains to be done, especially in arid regions. A closer analysis of the wind erosion situation in these areas will show that if this phenomenon is to be controlled and contained, there is a need, first, to appraise and understand existing know-how and, second, to select and apply the appropriate mix of technology in the context of integrated land management. Wind is air in movement, caused by a gradient in the air density generated by differences in atmospheric pressures and/or temperatures. The erosive power of wind, as in the case of water, increases exponentially with velocity but, unlike water, wind is not affected by the force of gravity. However, the length of unobstructed terrain (fetch) over which the wind flows is important in allowing the wind to gain momentum and to increase its erosive power. Air movement must attain a certain velocity or become an "efficient wind" (with enough speed to generate visible movement of particles at the soil level) before it can generate deflation and transport of particles. Winds with velocities of less then 12-19 km/hr at I m above the ground seldom impart sufficient energy at the soil surface to dislodge and put into motion sand-sized particles. Drifting of highly erosive soil usually starts when the wind attains a forward velocity of 25-30 km/hr at a height of 30 cm above the soil surface (Hopkins et al., 1937). Several factors, other than the wind velocity itself, contribute to wind erosion. These fall into two main groups of closely interrelated elements: those inherent in the properties of the soil per se and those associated with soil cover. Erodibility of the soil is increased by dryness. Moist soils generally do not blow or move, but soil moisture is seldom available at the surface in the arid zones. A rough soil structure, especially at the surface, effectively reduces the movement of soil particles. Arid regions, however, are dominated by smooth, pulverized and structureless top soils. Soil texture also influences soil erodibility; soils of fine texture are, for example, particularly susceptible to wind erosion. Measurements of dust in the air up to three metres above the soil surface at Jodhpur, India, showed that on a stormy day the amount of dust blowing varied between 50 and 420 kg/ha (Mann, 1985). In the Jaisalmer region of India, where wind speeds generally are higher, average soil loss of 511 kg/ha was recorded. The presence of protective vegetative cover such as grass, shrubs, cultivated crops, even stubble, decreases the velocity of the wind and minimizes its eroding capacity. Moreover, the root system of vegetation helps to compact and keep together soil particles. Organic material, or humus, from the vegetation improves soil texture and structure. Thus, destruction of vegetation cover by fire, cultivation, overgrazing, uprooting for fuelwood or prolonged periods of drought exposes the soil to the erosive action of winds, the velocity of which in arid regions is highest in the hot summer months. · control the source of dune-building material. · spacing of shrubs and trees on grazing lands to reduce wind velocity. 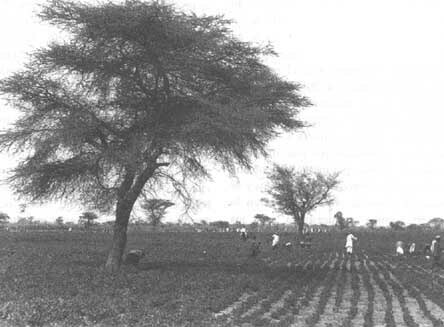 The cultivation of crops on arid lands without causing wind erosion is possible provided one or more appropriate basic land-use principles are observed. A number of these are discussed below. Tillage practices should create soil roughness by leaving clods in the soil or by making ridges and furrows perpendicular to the prevailing wind direction. For soil ridges and furrows to be most effective they must have resistant soil clods on the surface. Cloddy furrows will limit wind erosion until the clods are broken down by additional tillage, weathering or erosion. The effectiveness of tillage in reducing wind erosion is improved when residue crops or crops with extensive root systems are grown to increase the organic-matter content of the soil. In the case of sandy soils this tillage practice is not effective, because of soil texture and lack of cohesiveness. Surface and crop residues can be retained after harvest, which generally coincides with the dry season, to provide soil cover and reduce wind erosion. Residues, however, are not always available in arid regions and are often eaten up by free-ranging livestock. Unfortunately, even stubble after harvest of barley or wheat is often burnt, thus depriving soils of protective cover. Strip cropping reduces the width of the field area where the soil is exposed to wind erosion. Alternating strips of crops and fallow or strips of clean cultivated crops with strips under grass goes a long way toward reducing wind erosion. However, because of land shortages in arid regions, strip cropping is not widely practiced. Crop rotation, apart from improving soil fertility, avoids the undue exposure of the soil to dryness and wind erosion. Grain followed by a legume, then by a row crop or fallow, and then back to grain adds residues to the soil which bind soil particles. However, with the availability of inorganic fertilizers, crop rotation is losing popularity. In the dry tropics, currently a combination of legumes/shrubs/trees is receiving attention. Intercropping is widely used in many arid regions, and several systems have been developed. One system which is receiving attention is that of "oasis agriculture", where two to three layers of vegetation are used a dominant palm-tree layer, an understorey of fruit-trees and a ground-level crop layer. This system is part of traditional agriculture practiced in areas of Iraq and of upper Egypt where irrigation is possible or in natural depressions and wadis where soil moisture is available. Over the past 15 years Mauritania has been hit particularly hard by the drought and desertification that have affected all the countries of the Sahelian region of Africa. In an attempt to combat the negative effects of desertification on the environment, the resource base and the people who depend on them, the government (with technical assistance from FAO and financial support from the United Nations Development Programme and the UN Sudano-Sahelian Organization) is in the process of developing a National Plan for Desertification Control on a region-by-region basis. FAO has also been providing technical assistance in the implementation of specific control measures to stabilize sand dunes and improve agrosilvipastoral management. Over a seven-year period the project has assisted in the construction of more than 800 km of windbreaks spread over 75 sites. The choice of construction material has been gradually altered over the course of the project. Originally, wind-break construction was planned using Leptadenia sp. and palm fronds. 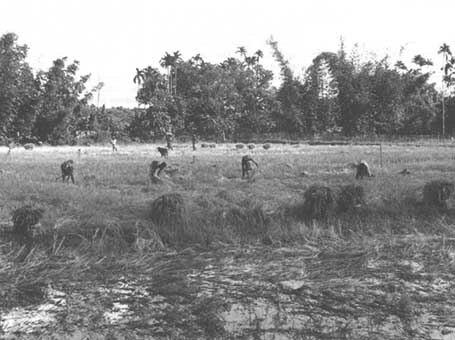 However, two challenges emerged: Leptadenia was found to be relatively scarce, and although palm fronds were present in sufficient numbers, they were put to other uses by the local people and were therefore not available unless purchased by the project. The project staff began to experiment with other species; one of these was Balanites, which had originally been discarded owing to its spiny branches. When tested, it was found that Balanites was extremely efficient in reducing sand movement, and also a good barrier against encroachment by grazing animals. By the end of 1989, more than 80 percent of the wind-breaks were being constructed with Balanites. Truck transport of materials for the windbreaks was originally foreseen, but during the second phase of project activity it became apparent that most transport could be undertaken more efficiently and cost-effectively using draught animals. Transport using donkeys was initiated in 1987; by the end of 1989 animal draught power accounted for 83 percent of all transport. The project has also been active in revegetation work, with both herbaceous and woody species, alone and in combination. It is noteworthy that the establishment of a combination of herbaceous and woody species in the driest areas was found to be particularly difficult; the grassy plants tended to grow more quickly, completely absorbing the scarce supply of available water. If woody species were established first, however, and their roots were able to penetrate below the level reached by the grasses, subsequent planting of grasses was possible without damage to the trees. Multistorey cropping systems make optimum use of solar energy, which is abundant in arid regions, by utilizing side (as opposed to vertical) light rays for photosynthesis. The plants in the upper layers provide shelter from excessive heat and ameliorate the microclimate below for those crops at the ground level. As a result, overall demands on limited soil moisture are reduced and crop production per unit area of land is increased and diversified. · olive groves/cereals in the Mediterranean basin. Other systems employ the planting of rows of fast-growing protection crops (maize) with crops that are sensitive to wind damage (tomatoes, beans). This system is employed in areas where water stress on the protected crop is not a problem. Controlled grazing by regulating the number of animals and periods during which rangelands are grazed does much to protect and perpetuate vegetation cover. Unfortunately the periodic "resting" of rangelands to encourage vegetation recovery is not always practical. This is due to the large numbers of livestock and the absence of alternative sources of animal feed to sustain the animals during periods of closure of the open range. The reseeding of rangelands and the cultivation of scattered trees and shrubs in them has not only improved the carrying capacity of such lands but also contributed to the reduction of the wind erosion hazard. The fodder obtained from trees and shrubs can provide a critical element in the diets of animals, especially during years of drought when other annual forage species are not available. As in the case of water erosion, forestry has an important role to play in the control of wind erosion. Three forestry practices are now gaining wider application in the arid regions: wind-breaks and shelter-belts; sand dune stabilization; and multipurpose trees. Wind-breaks and shelter-belts are barriers of trees and shrubs planted in one or more rows at right angles to the direction of the prevailing wind. Their primary purpose is to reduce the velocity of the wind, filter floating dust particles and thus protect agricultural crops and livestock. By reducing wind velocity along the surface of the land, wind erosion hazard is also reduced. Experience has shown that wind-breaks should be permeable, with a vertical crown density of about 50-60 percent but not greater than 80 percent (Themes and Ffolliot, 1988). When the shelter-belt is dense and not permeable, most of the wind flow is deflected upward. Pressure on the downwind side of the barrier is reduced, causing turbulence which greatly reduces the velocity of the wind, but only for a short distance downwind of the barrier. The effect on wind velocity is related to the height (H) of the tallest trees in the barrier and, as a result, is expressed in multiples of this height. Normally, the effect is felt at distances of 20H to 40H. Properly managed shelter-belts and windbreaks can yield wood products from weedings and thinnings, pruning and rotation cuts without greatly reducing their protective effects. Egypt, for example, has a plywood and particle board industry relying primarily on raw material provided by wind-breaks of Casuarina spp. As a result of wind velocity reduction and microclimatic amelioration, windbreaks and shelter-belts in arid lands contribute substantially to crop and livestock production. The increase in overall agricultural production as a result of a properly planned system of shelter-belts in arid regions is around 30 percent. In some cases the cultivation of crops is not possible without effective wind protection, because the tender shoots of newly germinated crops are lacerated by the sand particles carried by blowing winds and then dessicated. In the Nile Delta in Egypt, where the newly reclaimed desert lands are exposed to dust-bearing winds, agricultural crops are considered to be a "by-product" of the extensive system of wind-breaks and shelter-belts established in the area. 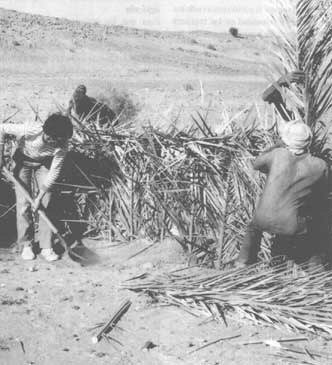 In fact, in districts of Egypt such as Nubaria, no crops can be grown successfully without wind protection. Stabilization of sand dunes is another example of a forestry practice with direct application in wind erosion control. When they are not covered with protective vegetation, sand dunes move in the direction of the prevailing wind. In the process, agricultural crops, forests and woodlands, irrigation channels and roads, oases and often villages can become endangered. To prevent this encroachment, dunes must be stabilized. Several techniques for sand dune stabilization have been developed. One traditional method involves the insertion of "palisades" or "micro-wind-breaks" into the ground and the spreading of vegetative material on the surface ("mulching" or "thatching") to immobilize the sand prior to the establishment of a permanent vegetation cover. Oil by-products (heavy oils, light waxy oil, crude oil, asphaltic oil) have been used in the Libyan Arab Jamahiriya and the Islamic Republic of Iran to stabilize moving dunes. Several chemical products are also available for the short-term stabilization of dunes until a vegetation cover develops. · more wood products such as fuelwood and poles, and other, non-wood products such as fruits, essential oils and honey. Multipurpose trees have always played a role in traditional systems of land management in arid lands. Scattered trees have provided fruits and fibres, energy and fodder. The establishment of fruit-trees (figs, pistachio, apricots, almonds, olives, carob) as well as fodder trees and shrubs is an important feature of soil and water conservation work on sloping lands. The inclusion of such species in conservation programmes contributes to production as well as to environmental protection. The practice of agroforestry in arid zones provides a buffer against the effects of erratic precipitation and cushions pressure on local resources during periods of drought. Moreover, multipurpose trees scattered on the arid landscape also reduce wind velocities and break the force of falling raindrops, thus reducing wind and water erosion hazards. In the dry regions, the action of wind complements that of water in eroding soil resources. A soil stripped of vegetation and exposed by the abrasive action of wind is rendered vulnerable to erosion by water. 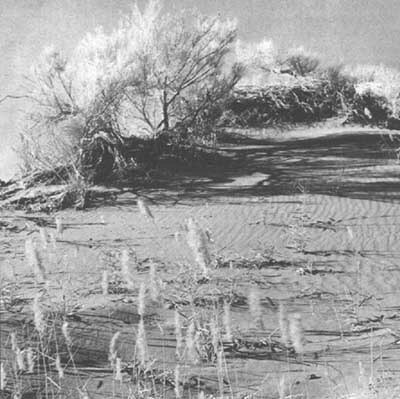 A barren outwash sediment deposit is exposed to wind erosion. As in the case of water erosion, where the ill-effects are felt far away downstream, the airborne dust particles rise thousands of metres into the atmosphere, and recent investigations suggest that this influences precipitation and may cause aridity. The deposition of dust and soil particles from Africa in countries of the northern Mediterranean region is a regular annual phenomenon. Since water, through the effect of gravity, moves according to a determined pattern, the areas susceptible to erosion may be predicted. In the case of wind, however, its horizontal and vertical movements are not predictable; hence, the areas threatened by wind erosion cannot be forecast with reasonable accuracy. The causes and effects of wind erosion suggest that no single control measure could effectively contain the wind erosion hazard. In the past, wind control measures have focused essentially on the use of windbreaks, in much the same way as water erosion control focused on the use of "gradoni" or "banquettes". Such measures and structures have proved cost-effective only in the case of large holdings under single ownership, such as state forest lands, or in the case of large-scale land reclamation and settlement programmes. They have had limited application and success at the local farm enterprise level except where such schemes are sponsored and financed by a state or local authority. The solution to wind as well as water erosion problems in arid regions is not to be found only in mechanical soil and water conservation structures and practices or in rows of trees placed like soldiers against the prevailing winds. Such measures are only palliatives. The answer lies in the evolution and application of land management systems which recognize no frontiers between agriculture, forestry and animal husbandry. This does not necessarily mean adoption on an exclusive basis of agrosilvipastoral systems. It implies the evolution of land management based on the adaptation and introduction of new biotechnology to traditional farming systems which originated in the arid regions. Building upon not abandoning traditional land management is the real challenge for the sustainable development of renewable natural resources in arid regions. The problem of wind erosion needs to be addressed within this broader context. Hopkins, E.S. et al. 1937. Soil drift control. Canadian Department of Agricultural Publications. Mann, H.S. 1985. Wind erosion and its control. FAO Conservation Guide No. 10. Rome, FAO.